Stunning 3 bed detached villa on quiet private corner plot in Polaris World's premier golf resort, with full AC, c.h. and private pool and terraces. Elegantly furnished. This bright and airy villa occupies a convenient corner plot and therefore has extra degree of privacy. It has been built to the highest specifications with marble floors throughout and every mod-con. As it is intended to be our home, we have personally furnished it to a high standard with attention to detail. There is central AC as well as central heating. The kitchen is fully fitted including an American style fridge freezer dispensing ice and filtered water. The living room with its cathedral-like high ceilings has salubrious soft leather sofas seating 5-6 and an antique oak coffee table. This matches the dining table with its 6 upholstered chairs and the beautiful sideboard. Wall pictures, chandeliers and standing lamps combine to create a luxurious ambiance. Several French doors and windows with pretty wooden shutters provide a delightful outlook onto the terraces at the back and sides- and directly onto the swimming pool. There is a 32” television with satellite to receive several English channels and DVD player. There are 3 bedrooms. The master has a double bed and an en-suite bathroom which includes a jacuzzi bath and shower and double sink and looks out through French doors onto the pool area. The other two have twin beds and are served by a second bathroom. All have spacious fitted wardrobes. Outside, there is a private swimming pool and shower. This is serviced once a week. A terraced pergola provides a pleasant seating area for drinks. On the side of the villa, accessed from the pool area as well as the kitchen, is a bbq terrace with table and 6 chairs to provide that ‘al fresco’ dining experience. During the balmy summer months this part receives a refreshingly cooling breeze. By the pool there are also several sun loungers. This area receives sun almost all day as it faces east. In the front there is a private car port and plenty of off street car parking as well. Nestled in a semi desert valley in the foothills of the Carrascoy mountains just beyond Murcia city, this is Polaris World’s premier golf resort. In a beautifully landscaped setting, that is designed for both permanent living as well as serving as second/holiday homes, is a testing 18 hole Jack Nicklaus signature course which includes two lakes and undulating greens. This is a very exclusive resort, beautifully maintained, and ideal for a relaxing family holiday that can cater for the enthusiastic golfer as well those inclined to take it easy. Wonderful for evening strolls (golfer or not), the entire gated resort has 24 hour security surveillance. On site there is a golf clubhouse, bar and restaurant, gym, communal swimming pool and Spar supermarket. The Costa Calida has a magnificent climate with all year sunshine and even winter temperatures averaging 18°C - ideal for all kinds of outdoor sports and recreation. The region of Murcia is relatively new to foreign tourism. Compared to more populated areas farther north up towards Torrevieja and Alicante on the Costa Blanca, this area – even the beaches- is surprisingly un-crowded and retains its very Spanish atmosphere, with mostly Spanish residents and tourists. It is a place which has something to offer all who appreciate luxury at an affordable price- at least for now. Inland offers unspoiled conservation areas with a wide range of bird life, the opportunity to go horse riding, cycling, walking, climbing, trekking and para-gliding. At the same time the chance to savour the peaceful rural sights. This area is an historical adventure with cave dwellings and paintings, incredible architecture and museums. For golf lovers there is a wealth of courses to suit all levels in El Valle, La Torre, Mar Menor, La Manga and other resorts throughout this region. The gorgeous beaches of the Costa Calida are marvelous for swimming, snorkeling and scuba-diving. The shallow waters of the Mar Menor lagoon reach temperatures akin to a warm bath during summer months and are perfect for learning to sail or windsurf at the sailing schools under the watchful eye of full RYA instructors. Water-skiing is widely available throughout the summer months and often during winter too. In San Pedro de Pinatar there is an area along a jetty where you can bathe in waters that contain a black mud which you can spread on yourself and feel silky afterwards- a free mud bath! A perfect place for both an energetic or relaxing holiday! The nearby town of Torre Pacheco is typically Spanish with quaint squares and a wealth of restaurants and bars to try. The coastal towns of San Javier and Los Alcazares are about 20 min drive away with everything a seaside holiday town has to offer. There are numerous beach bars and restaurants where you can enjoy music, tapas or excellent meals. Los Alcazares still has thermal baths, which have been there from Roman times! You can walk along the beautiful promenade with views over the Mar Menor to La Manga on the other side. Fishing boats and miles of sandy beaches complete a pretty picture. Los Alcazares holds two weekly street markets, selling various products such as clothing and fresh food. Throughout the last two weeks in August, groups representing market garden areas throughout Spain and other European countries gather to display their folklore, handicrafts and prepare gastronomic feasts from their local produce. These times change -so need to check beforehand. Murcia city (15 min) and Cartagena (30-40 min) are both well worth a visit each with their own charm, uniquely Spanish. Murcia with its grand cathedral, pretty squares with pavement cafes and a maze of small side streets with little shops, Cartegna with its historic port area. Further afield there is Torrevieja (about 40 min) and Alicante (about 1h) which have plenty of sights and leisure activities for day outings. For the shopoholics, Murcia city is probably the best bet. In addition to the numerous city centre shops that include El Cortes Ingles, there is Nueva Condomina, a sprawling new complex that includes Ikea and many restaurants, located just to the north of the city (25 min pleasant drive from El Valle through the mountains straight down the motorway). Cartegena also has some shops in the centre as well as in the large ‘out of town’ complex that has Carrefour, Media Mart, Leroy Merlin, Toys r Us, a garden centre, Casa and others, plus a huge mall with various shops on 2 levels. Dos Mares in San Javier is a large Mall that has a selection of small shops, bars and restaurants, cinema, bowling and also an Eroski supermarket. Many chinese shops have also sprung up in that same area. These have a huge variety of low-value everday items. Our favourite for food and essentials shopping is Carrefour in Murcia city – about 15-20 min from El Valle. In the same Mall there are also some restaurants and clothes shops and mobile phone outlets. There is also Lidl on the opposite side of the road. On the way to Carrefour there is also an Eroski hypermarket and a Media Markt for electronics. If you just want something without the excursion - there is a Spar supermarket for food on site as well as at La Torre resort.- a bit more expensive. 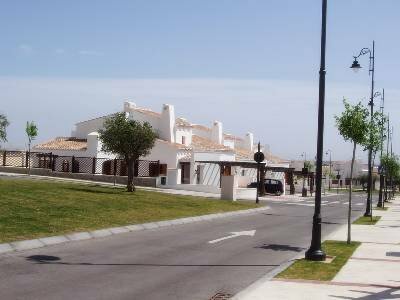 There are many good places to eat in the larger cities as well as the little towns especially around San Javier.